On a sun-soaked Sunday afternoon in late May, hundreds of people gathered at a two-story black and gold building in New Orleans’s Mid-City neighborhood. The Zulu Social Aid and Pleasure Club headquarters hosted its annual Characters of Zulu selections while revelers enjoyed live music, food and drinks throughout the day. Andrew “Pete” Sanchez Jr. emerged from the festivities as the King of Zulu — the most important selection of the day. The crowd erupted in cheers at the announcement of Mr. Sanchez’s crowning. 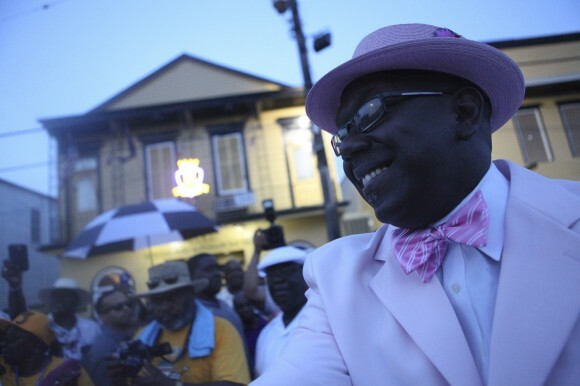 A second line band played as people filled the street. Some took pictures and congratulated him on his win. Mr. Sanchez disappeared briefly, then emerged seated on the back of a convertible dressed in a crisp pink suit. He waved, stopped to take pictures and proceeded to enter the club for the first time as its newly elected King of Zulu. Representatives were chosen for the Witch Doctor, the Big Shot, the Ambassador, the Mayor and Mr. Big Stuff as well. The Zulu Social Aid and Pleasure Club made its debut in 1909 but was not incorporated until 1916. Its original purpose was to offer financial assistance to members for burials. More than 100 years later, the organization remains an essential part of the New Orleans community.